The judges chose Jason Nale's "Slatington" design as the first place winner for its layout and obvious attention to detail. Although there is a lot going on, the design doesn't appear busy due to a well-defined foreground and background. Non-essential elements recede into the background, allowing the eye to focus on the important messages. The design has dimension with plenty of negative space bringing your eye into the center of the design. Jason wins a $150 cash prize and his choice of any LHF font. 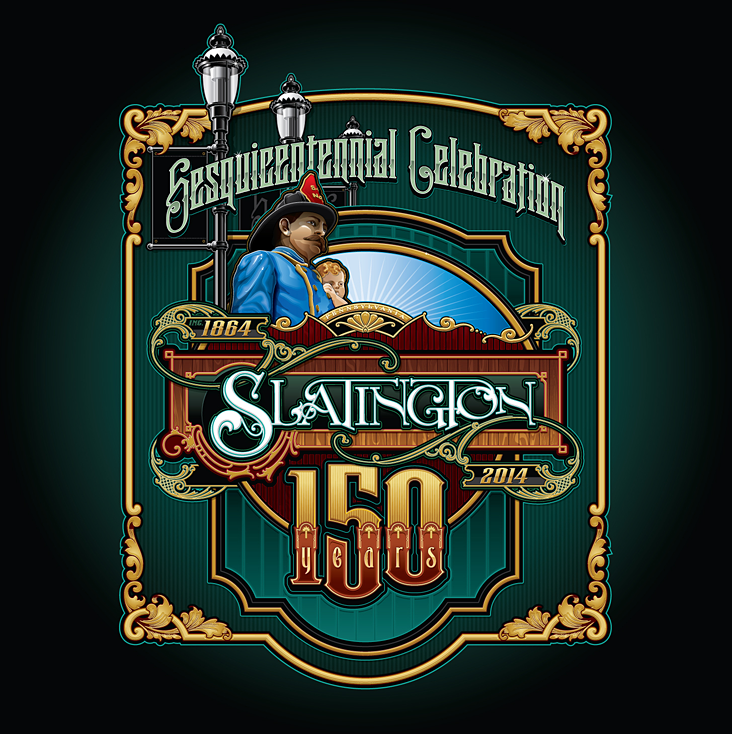 Fonts used: LHF Hamilton Ornate™ ("Sesquicentennial Celebration"), modified LHF Confection™ ("Slatington"), LHF Valenica™ (numbers), LHF Victoria™, LHF Centennial Panels 2™ (inside scrolls), LHF Classic Panels 2™ (outside leaf border). Chuck: Can you tell us more about the Slatington design? What I'm most amazed at is that you were able to pull off such a masterful design for a city. I've attempted to deal with cities before and I know how everyone wants a say so. So you usually end up with a design that is a horrible mishmash of elements. Designing for a city or other large organization where power is everything is very difficult. statue in the center of town of a fireman holding a baby and that is where the illustration I created came from. The light post illustrations are of actual light posts that run through the town. I knew the final design would be used on pole flags mounted to those posts, so I created those flags. Chuck: How did you choose the fonts you used? Jason: When I start a design, I look through my fonts and choose maybe ten or twelve fonts that I think will look good in the design. Sometimes this happens quickly, sometimes it requires more choices, but it’s usually around this number. Then I start weeding out the ones in the list that are less likely to make it into the final design. I usually get it down to two or three that I really think will be the one and work with those. As for the fonts I chose in this design, I think that Hamilton Ornate being a condensed font was probably one good reason I chose it. Those two words weren't easy to fit. It’s also one of my favorite fonts and I thought it really went with and added to the overall look of the design. As for the word Slatington, I would have to say pretty much the same reason as to why I used Hamilton Ornate; I really like the look of the font and it really helped me to portray the look and feel that I was going for in the overall layout. I enjoy altering fonts for a different look and this one is a great font to add little flourished to or mold with other characters. Both Hamilton Ornate and Confection are good fonts to manipulate. Chuck: What about the panels? nice to have that solid base to use and save some time as well. Most, if not all of my designs have some type of constraining border or frame to them. I’ve always liked my designs to have an enclosing shape and I love panels. Not that elements in the design do not ever break that boundary, but just that it has an overall shape to it.